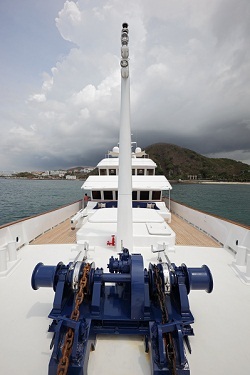 Anchored just off the shores of the lush and luxurious South China-based Mandarin Oriental resort, SYT editor Maarten Janssen was invited to a private viewing of 51 metres superyacht Northern Sun during the successful 2012 rendition of the Hainan Rendezvous that took place last week. 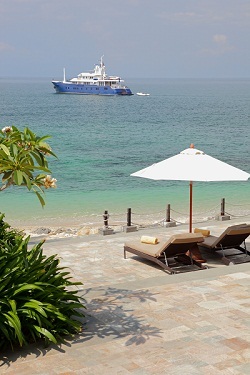 The 5-star resort, located in Sanya, Hainan, is the summit of luxury accommodation in the wide region. In other words: it is the most appropriate setting to start off a viewing of this magnificent superyacht. Upon invitation of the vessel’s broker, we are picked up on the shores of Hainan by her SEAT 219 rigid tender and comfortably taken onboard to discover everything Northern Sun has to offer. The intrigue starts with her looks, which are a combination of a sturdy and robust shapes combined with elegantly balanced lines, boasting an image both strong and refined. And strong she surely is, with an ice strengthened hull that embodies everything necessary to take on the longest of journeys. This azure hull steadily floats on the soft waves of the South China Sea and upon boarding one is instantly taken by the superyacht’s spacious character. 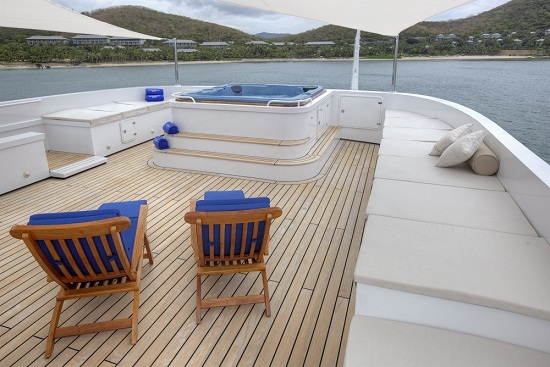 Even for a vessel of this size, the aft deck is lush and offers gorgeous panorama views. 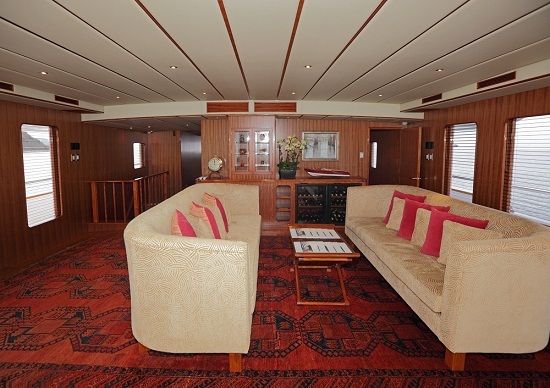 Upon viewing the saloon, one of her most striking features is instantly unveiled: the concept of space and surrounding vista’s, bathing in natural light, is continued from the aft deck into this grand saloon, which impressively covers the whole of the main deck’s interior. The aft part consists of an intimate lounging setting, with a set of elegant armchairs and comfortably large L-shaped sofa inviting guests to sit down, relax and take in the interior luxury and unobstructed views outside. 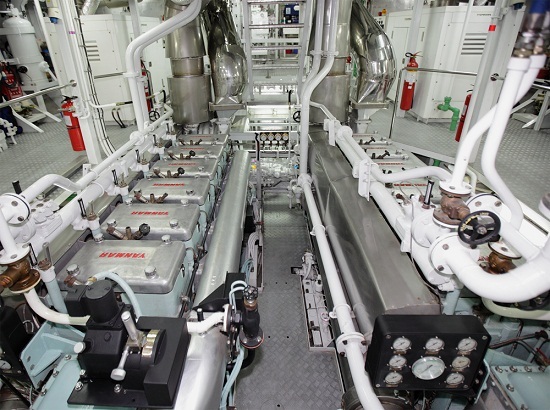 From here, a port side corridor leads to the central portion of the saloon deck. This area consists of a large and informal sitting room, with a setting of large inviting sofa’s and one big armchair all in a subtly fresh green upholstery which blends well with the dark lacquered wood and sets the tone of this area to classically contemporary with an oriental look and feel. This oriental soul in Northern Sun’s interior design trickles out in the details, with the naturally reddish-brown tone of precious Makore wood used throughout as a subtle foundation for the design scheme. Centerpiece in this area is the coffee table which faintly resembles an antique traveling chest, with a lush golden shimmer that charms and entices. A colourful asian carpet and playful woodwork in the side tables complete the distinct soul of the orient, which is integrated throughout the entire interior design. The fore saloon area was designed as an entertainment area, with card table and a privately placed set of comfortable armchairs. 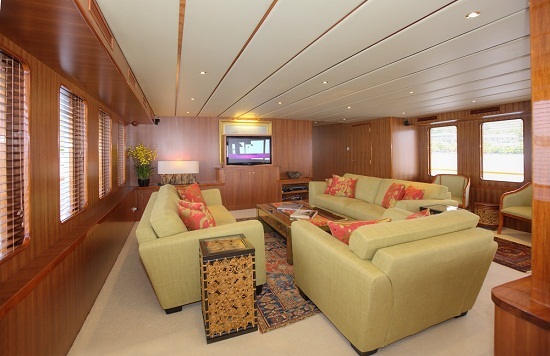 Here, the main design ingredients are the surrounding views, which are dramatic and grand, seemingly omnipresent throughout the entire main saloon but most enjoyable in this section of the vessel. Overall, the interior design is aimed at elegance and luxury, emphasising the natural tones of the Makore wall-paneling and and Nara flooring, the former of which has also been applied in the design of chairs, tables and cabinets. The interior is brightened up and tied together by the use of fresh colour details in upholstery and ceilings, resulting in a palette of colours and materials that balances the classic with the subtle, a blend of rich reds, fresh green and a hints of lush gold. From the fore main saloon, an open staircase leads down towards the lower deck, where a second saloon encompassing the main dining area can be found. 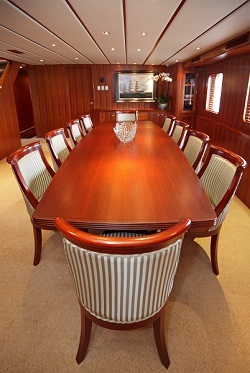 Set in a similar design as the main deck saloon, the deep woods emphasise a subtle lighting scheme and set focus on the large central dining table, which offers seating to a company of up to ten guests. The atmosphere is intimate, feeling as a true extension of the main saloon, yet feeling pleasantly secluded and intimate. It is easy to imagine this space being used for both formal and informal dinner parties. 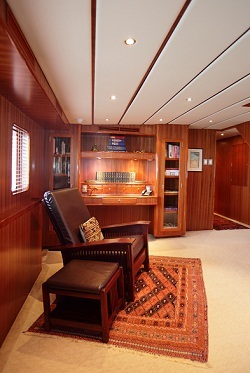 As the dining area covers the port side of the lower deck saloon, the starboard side was set up as a combined lounging and office area. 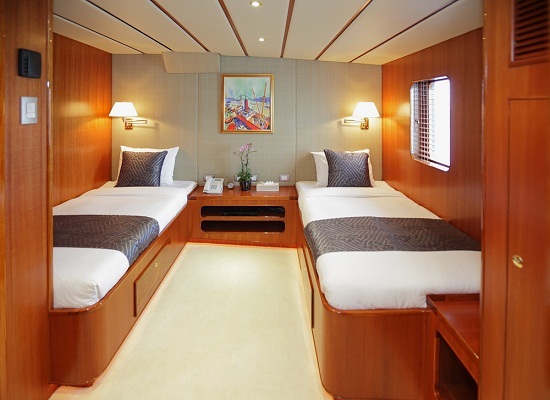 Guest cabins can be found on the aft lower deck, configured into three doubles, one with additional Pullman, and two twins. Each cabins has a luxurious en suite bathroom, all executed in a slightly lighter, more intima rendition of Northern Sun’s toned down, classic style. 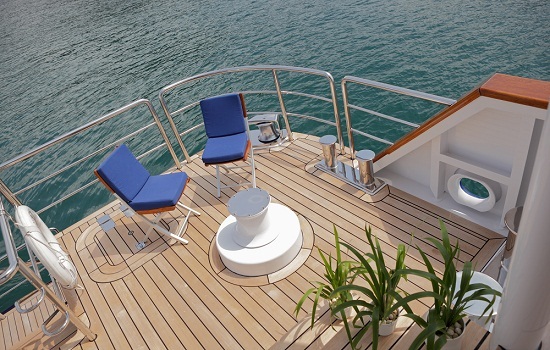 Each cabin enjoys a lush outside view, yet assuring maximum privacy courtesy of the elegant wooden shutters. Cream coloured carpeting and upholstered wall paneling transform the interior into a soothing and soft atmosphere for guests to enjoy. The onboard art collection is centered around a maritime theme, spanning a variety of styles and periods. From expressionistic to romantic and even a classic poster advertising the services of Messageries Maritimes, the French colonial-era line connecting citizens with the former overseas territories. 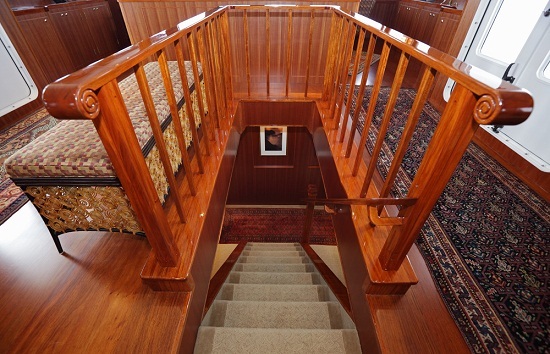 The owner’s quarters can be found fore of the lower deck dining room and saloon area, resulting in an extremely private and conveniently located area. 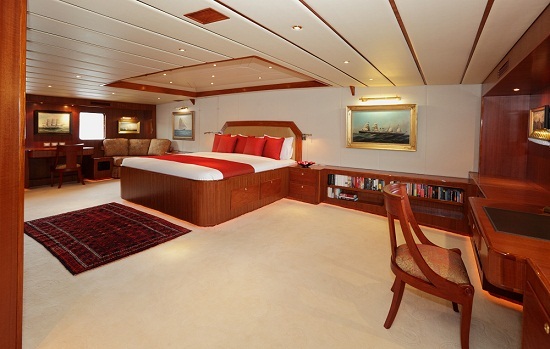 Of all cabins, the owner’s stateroom is the brightest, largest and boasting the most personal interior style. With a large bed, two office areas, large en suite bathroom and magnificent panorama views, these quarters offer optimal privacy and luxury. Northern Sun assures each guest ample comfort and style, accommodating a company of up to 12 guests. And with a crew of 12-14, it is almost superfluous to point out how spacious this superyacht really is. Right upstairs from a multipurpose cabin, which functions as an additional guest cabin, accommodation for nanny or bodyguard, and even an extra office area, the intimate sun deck can be found. This area offers the perfect space for some sunbathing or a pleasantly private al fresco dinner. With the Jacuzzi right at hand, this area is perfect for ample hours of entertainment enjoying the lush vista views. The upper aft deck offer ample additional space for sunbathing, with equally magnificent views framing this spacious environment. 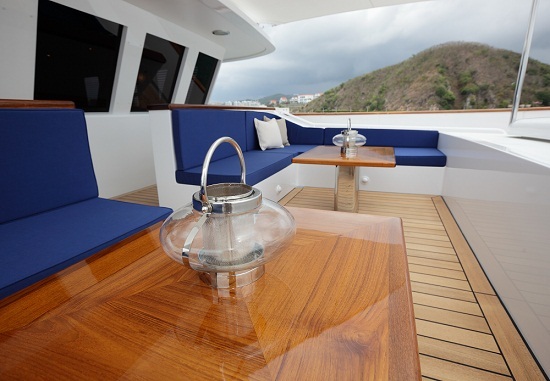 This area also functions as storage space for the superyacht’s two tenders: the aforementioned SEAT 219 and an ACS 2,8 metres Hammerhead RIB which is ideal for countless relaxing days of beach hopping and water skiing. Her array of watersport possibilities are very impressive, with her collection of scuba and snorkelling gear, plenty of room for jet skis, kayaks and even a small sail. Being currently for sale, Northern Sun is a superyacht offering a remarkable amount of space for price range. She was very recently refitted, with an extra outside deck added to the forward main saloon and a complete overall paint job leaving her looking and feeling as new. With her deep draft she has exquisite stability which, combined with her sheer size and level of comfort, turns her into an ideal partner for long journeys. 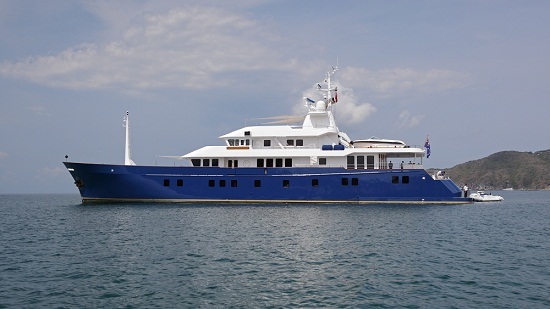 The Yacht is currently for sale with Miles Clark of Seanergy, asking $ 15,000,000.